*Time Regained. Translated by Andreas Mayor, 1970. *Time Regained, translated by Stephen Hudson (pseudonym of Sydney Schiff), 1931. Knopf printed only a few advanced reading copies, before selling the rights back to Chatto & Windus in the middle of publication. Hardback. 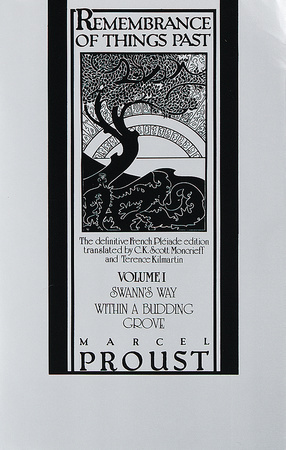 Multiple re-issues; numbered edition in 7 volumes. Hardback Edition of 12 volumes.. 1949 (OCLC 503896358) (A Delux Limited Edition also, 165/160) Multiple re-prints. —Kilmartin revised the Scott Moncrieff translation, using the 1954 French Bibliothéque de la Pléiade. In Search of Lost Time. Translated by C.K. Scott Moncrieff and Terence Kilmartin. Revised by D. J. Enright. —D.J. Enright revised the 1981 Scott Moncrieff/Kilmartin edition based on the 1987-89 the French « La Pléiade » edition. Enright also changed to title to In Search of Lost Time. Paperback Edition in 6 volumes, 1998-1999. —Translations are based on the 1987-89 French « La Pléiade » edition, except The Fugitive-based on 1954 definitive French edition. Hardcover Edition in 6 volumes, 2002. In Search of Lost Time. Translation by C. K. Scott Moncrieff. Edited and Annotated by William C. Carter. Softcover Edition scheduled to be 7 volumes. eBook Edition in 6 volumes, 2003. Hardcover in 4 volumes, 2001-2007. Paperbacks and one Hardcover in 5 volumes.